“In life the possibility of meeting a bully is always present. 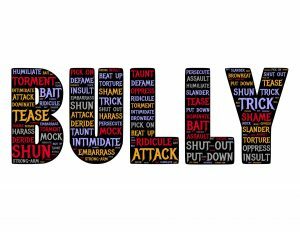 Bullies come in many forms: big strong boys/girls/adults, small quiet people with the knack of saying hurtful things, clever/devious people who know when to say things that make others feel humiliated etc. Bullies are found in schools, companies, universities, i.e. everywhere. There are three important skills to help you cope with a bully: “Name the person. If you experience anything that makes you feel as though you are a victim in some way, tell a caring adult about this experience. Don’t let the bully remain un-named – this gives them power to continue tormenting you and others. By naming them (and your experience), help can be organised for both yourself and the bully. Naming takes courage, but is the most important step in stopping the bully and helping you gain control of your own experiences. Learning to Name, Tame and Claim are three very important life skills. They will help you deal effectively with most problems that come your way. If you would like to learn more about this important topic, please check out our Life Talk book series over here.